Have a memory like a steel trap? Neither do we. 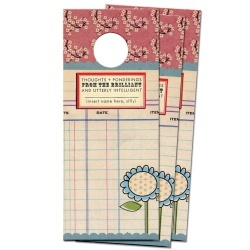 But ever since we started jotting down all of our latest and greatest thoughts on our door hangers, forgetfulness has become a thing of the past! Let your brain take a break, and keep all of your thoughts in the handiest of locations: your door knob! Turn your "Honey Do" list into a "FUNny Do" list! Our fun and fabulous hangers will keep your honey on their toes. Leave a little note or reminder here and there. Your honey will never forget a thing!! Buy some for yourself and for the forgetful Frannies in your life. Other Info:Each hanger measures 3.6" X 8.5". Set comes complete with 10 door hangers.